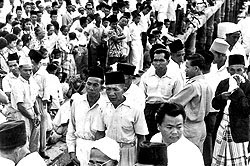 During the Haj season in the yesteryears, the old Customs Wharf (now BSB Waterfront) will be flooded with relatives and family members waiting since dawn for the arrival of the government ship carrying Haj pilgrims sailing from Labuan Island. Disregarding the feelings of fatigue and tiredness, family members will wait patiently at the dock for hours on end for the arrival of the pilgrims. 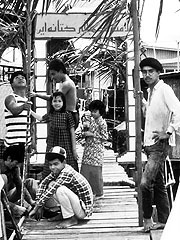 Some even went as far as waiting for the pilgrims using 'Tongkang', 'Kumpit', and 'Pemukatan' (fishing) boats at Pulau Chermin, Kuala Sungai Brunei, and Pulau Sibungur; in order to spot the oncoming government ships. Every house of each of the returning Haj pilgrims will have an arch erected outside their house, with decorative writings in Jawi such as 'Welcome Home', Additionally, wooden bridges from the jetty towards their house, will also be decorated with young nipah leaves and bamboo shoots, and colourful flags. Recalling the return of Haj pilgrims during the 1950s, 1960s, 1970s and the 1980s, it should not be forgotten to this day. When Haj pilgrims are safely returned to their residences, a white (puaidai) fabric is rolled out over the entrance of the house, a tradition Brunei has long practised since the 1950's, allegedly to earn blessings from and the provision of Allah the Almighty to enter the Holy Land in accordance with an intention to fulfil the Haj pilgrimage, the fifth pillar of Islam. Now however, the traditions of old as stated above, are no longer being practised. However, a Doa Selamat is still carried out to bless the safe return of the Haj pilgrims.